Ben Franklin was a man of many and varied accomplishments- a Renaissance man in the grand tradition of Leonardo da Vinci. He was a writer, scientist, musician, inventor and innovator, despite only ever receiving 2 years of formal schooling. His ideas and principles helped shape his fledgling nation, and his diplomatic skills assured the newly born United States of America received a modicum of respect in the European arena. Contrary to what many think, Ben Franklin was never President, but he is often referred to as the “First American”, and he certainly did mirror many of the best traits of the new nation – wit, curiosity, confidence, and boundless energy- he also struggled with his weight and was somewhat obese for a good portion of his lifetime… so, heh, First American indeed. 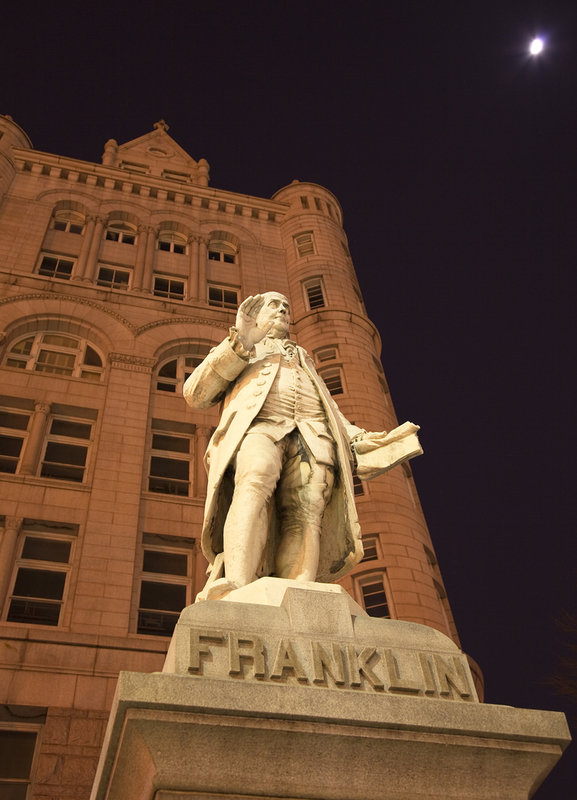 😉 Without further ado, here are 10 interesting Ben Franklin facts for your reading pleasure. Ben Franklin was 1 of 17 children fathered by Josiah Franklin (the 15th child overall and the 8th to Josiah’s second wife). When Ben was 12, his father sent him to work as an apprentice in a print shop run by one of Ben’s older brothers (of which Franklin had 9). Young Ben immediately took to his new trade, but James repeatedly refused to publish any of Ben’s writing, so Little Brother fought back by writing letters under a pseudonym to his brother’s newspaper, The New England Courant. The 14 letters submitted by “Mrs. Silence Dogood” – supposedly a middle-aged widow – were immensely popular with the paper’s readers, even resulting in several marriage proposals, thanks to the writer’s unique wit, humor and imagination. Instead of being grateful for the boost in his paper’s readership, James blew a gasket when it was revealed that “Mrs. Silence Dogood” was actually his bratty kid brother making sure his work got published one way or another. Soon after, Franklin decided he’d had enough, and walked out on his brother and his apprenticeship, the latter of which was a major no-no in that era. like minded aspiring artisans and tradesmen who hoped to improve themselves while they improved their community…. The rules that I drew up required that every member, in his turn, should produce one or more queries on any point of Morals, Politics, or Natural Philosophy, to be discuss’d by the company; and once in three months produce and read an essay of his own writing, on any subject he pleased. Our debates were to be under the direction of a president, and to be conducted in the sincere spirit of inquiry after truth, without fondness for dispute or desire of victory; and to prevent warmth, all expressions of positiveness in opinions, or direct contradiction, were after some time made contraband, and prohibited under small pecuniary penalties. These group meetings were the inspiration for many of Franklin’s best ideas, including the volunteer fire department, lending library and public hospital. The University of Pennsylvania also owes its existence to these weekend brainstorming sessions. In the end, it is probably best that he didn’t patent his stove as numerous improvements were quickly made over the basic design without need by people to acquire patent rights, resulting in a far more functional and efficient stove than Franklin originally conceived. (The original design had ventilation problems owing to the vent being in the floor of the stove. This problem was quickly corrected by others.) The results were astounding in terms of the improved efficiency of home heating with the perfected Franklin Stove over traditional fire places of the day. Of course, more advanced designs have since been created that are drastically more efficient than the perfected Franklin Stove, but in its day, it was a huge leap over traditional open fireplaces with straight chimneys where most of the heat escaped from. This give freely philosophy of inventions also extended to other aspects of Franklin’s life and he is often credited as inventing the idea of “Pay it Forward”. In fact, he does seem to have independently “invented” the concept, at least the first documented evidence of “Pay It Forward” was from him until the 20th century when a papyrus with the near complete award winning 3rd century BC play Dyskolos by Menande was discovered and re-published, which featured the idea of “Pay it Forward”. I do not pretend to give such a deed; I only lend it to you. When you … meet with another honest Man in similar Distress, you must pay me by lending this Sum to him; enjoining him to discharge the Debt by a like operation, when he shall be able, and shall meet with another opportunity. I hope it may thus go thro’ many hands, before it meets with a Knave that will stop its Progress. This is a trick of mine for doing a deal of good with a little money. … my Way is, to divide half a Sheet of Paper by a Line into two Columns, writing over the one Pro, and over the other Con. Then during three or four Days Consideration I put down under the different Heads short Hints of the different Motives that at different Times occur to me for or against the Measure. When I have thus got them all together in one View, I endeavour to estimate their respective Weights; and where I find two, one on each side, that seem equal, I strike them both out: If I find a Reason pro equal to some two Reasons con, I strike out the three. If I judge some two Reasons con equal to some three Reasons pro, I strike out the five; and thus proceeding I find at length where the Ballance lies; and if after a Day or two of farther Consideration nothing new that is of Importance occurs on either side, I come to a Determination accordingly. 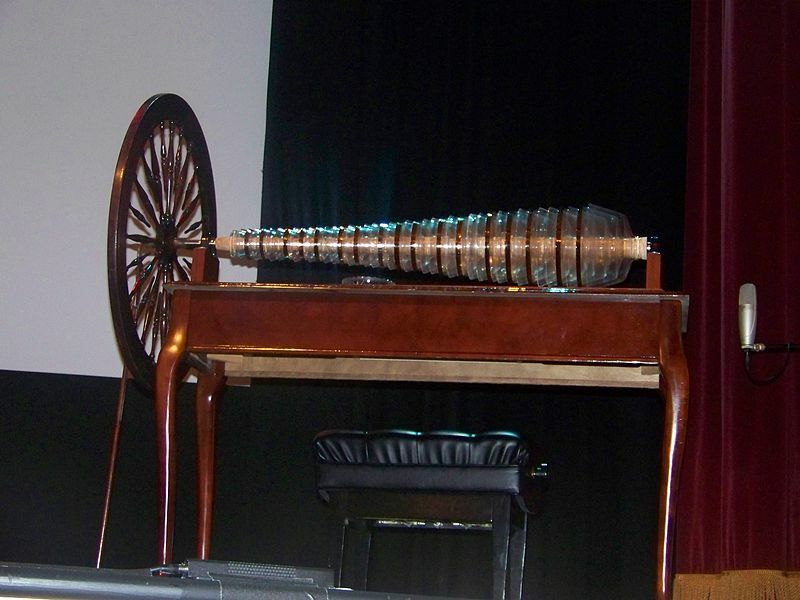 In 1761, Ben designed the glass harmonica – or armonica as its creator liked to call it – the first musical instrument “born” in America. (Not to be confused with a mouth harmonica.) This was a modification of the old glass bowl organ, with the bowls now set sideways and overlapping, spun using a foot pedal. This design allowed for easily playing as many as 10 bowls at the same time, which was not even close to possible in traditional upright designs. This new instrument became very popular, and music written expressly for the glass harmonica was composed by such legends as Mozart and Beethoven. The harmonica excessively stimulates the nerves, plunges the player into a nagging depression and hence into a dark and melancholy mood that is apt method for slow self-annihilation. If you are suffering from any kind of nervous disorder, you should not play it; if you are not yet ill you should not play it; if you are feeling melancholy you should not play it. Ben started dabbling with electrical experiments when he was in his mid-40s. His experiments were typically conducted by trial and error, using simple tools such as glass tubes, corks, wax plates and iron shot. As he progressed with his experiments, he introduced new terminology to explain the concepts he was working with, such as “positive” and “negative” charge. Franklin lamented the inconsistencies in spelling, as well as letters he viewed as redundant in the English alphabet. Thus, he invented his own phonetic alphabet, getting rid of the letters c, j, q, w, x, and y, and adding other letters for certain sounds that were common but underrepresented in the existing English alphabet. This was published in his Political, Misclel-laneous, and Philosophical Pieces under A Scheme for a New Alphabet. Needless to say, his alphabet did not catch on. In the years before the Revolution, the colonies were often subjected to warfare instigated by other European countries with a stake in the New World. In response to this, Ben sponsored a lottery, raising 3000 pounds used to purchase cannons to defend against Dutch and French combatants that were threatening Philadelphia. In addition, Franklin was instrumental in organizing a militia when the local government was hesitant to do so. Great article. If all men were more like Ben, what a wonderful world it would be. Kevin from Visit Philly here – this is great stuff! We actually have a Ben Franklin Museum opening up here in Philly in late August. (It’s technically a re-do of the Franklin Court underground museum that opened in the ’70s but closed for renovation). We’re happy to tell/show you more if your interested! Thank you, Kevin, for the information. I should very much like to visit it. I hope they will have a glass armonica on view. It would be interesting to hear. The arguments against the harmonica were taken very seriously in their day, but are now regarded as pretty much BS. Enjoy! Uhhh…me again. Mozart wrote an an Adagio for Glass Harmonica. It’s on You Tube. Sad Franklin fact: his acknowledged illegitimate son, William, was a staunch loyalist. He and his father, a leading revolutionary, split apart. They were never reconciled. There are portraits; William looks a lot like his old man — the mother is still unknown.